I can't understand the above concept clearly. Please, provide the exact formulas(ie, explain clearly) for calculating the net runrate in IPL with authentic references(with examples). NRR = (Average runs scored per over by the team throughout the tournament) - (Average runs scored per over by the opposing teams against it). Also Cricinfo , says the following rules are applied in case a match is abandoned/ concluded a duckworth lewis method. Also only matches that never take place(abandoned without a ball being bowled) are not considered for the same i believe. Total runs -> This is straight forward. It is the score that a team scores (batting) and is scored against (bowling) in the whole tournament. Total overs -> This is the total overs played (batting) and delivered (bowling) by a team. This one has a catch though. If a team is all out within the stipulated 20 overs, then the overs considered for NRR calculation is 20 itself and not the actual overs played. If a team chases down a target before 20 overs, then the actual overs is considered for NRR calculation. 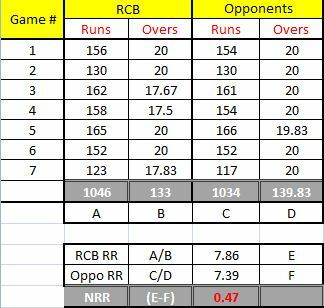 Find below the current RCB Net Run Rate (0.47) and the break-up of how the figure has been arrived at considering all the games that they have played till now. Across the three games, TEAM1 scored 678 runs in a total of 147 overs and 2 balls (actually 147.333 overs), a rate of 678/147.333 or 4.602 rpo. The run-rate scored against TEAM1 across the three games is calculated on the basis of 466 runs in a total of 50 + 50 + 50 = 150 overs, a rate of 466/150 or 3.107 rpo. A positive net run rate means a team is scoring faster than its opposition overall, while a negative net run rate means a team is scoring slower than the teams it has come up against. A positive NRR is therefore desirable. NRR is usually employed to rank teams that have finished a series or tournament on the same number of points. Note: 238.2 overs, meaning 238 completed overs and two further balls, was converted to 238.333 for the purposes of calculation. Not the answer you're looking for? Browse other questions tagged rules cricket statistics indian-premier-league or ask your own question.